Editor’s note: This is the fourth of a weekly guest spot by children’s media consultant Ashley. Ashley is a television and online producer and Executive Editor of Children’s Media Consultant.com. She holds a B.A. from Columbia University and a M.A. concentrating in children’s educational media and preschool ecology from New York University. She resides with her family in downtown New York City. You can visit her blog at childrensmediaconsultant.com. But that’s just one show. ONE show amidst hundreds of others that cater to young viewers. In a time in our world where everyone — from Wal-Mart to Chevrolet — sees sustainability as an important issue for our economy and culture, it seems amazing to me that the issue is pretty much ignored on children’s television. So when I received an email from Nickelodeon earlier this week with the subject line “Eco-Friendly Tips From Dora and Boots!,” I have to admit I opened it feeling a bit skeptical. Since I’ve researched and studied in graduate school how preschoolers think and relate to the natural environment, I’d like to think I know a bit about what an effective, responsible and significant preschool ecology curriculum might entail. And, with the exception of “It’s a Big Big World,” there isn’t much available in the children’s media realm (at least on television — I have yet to review a few new online properties that carry this messaging) that truly deliver on what they promise. From what I understand, this idea of programs promising to be green that don’t really turn out to be isn’t limited to children’s television. “Greenwashing refers to claims of environmental responsibility when little, if anything, of green substance has actually taken place,” says Stephen T. Del Percio, a New York based attorney, LEED accredited professional and publisher of greenbuildingsNYC.com. Greenwashing is a prominent concern among sustainability and environmental education experts. So is this email I received about “Dora the Explorer” going green the real deal? It looks as if Nickelodeon is promoting its upcoming on-air special “Dora Saves the Mermaids” by associating it with eco-friendly activities. (The special premieres on Nickelodeon in the US on November 5th, at 7PM ET.) I haven’t seen it yet, but apparently the story centers around Dora and Boots, who need to save the Mermaid Kingdom from an evil, garbage dumping octopus. In order to do so, Dora must transform into a mermaid herself and bring a magical crown back to Mariana the Mermaid. Does this sound like environmental education? Not really. Is this a brilliant marketing ploy filled with Dora-as-mermaid Halloween costumes, sea monkey kits and inflatable pool toys? Probably. On the other hand, though, the promotional site does contain “eco-friendly crafts,” such as a recycled bird feeder project made from a milk carton, and an article for parents titled “10 Eco-Friendly Activities for the Whole Family,” which contains ideas like the avoidance of brown paper bag lunches and sending e-cards instead of paper ones. 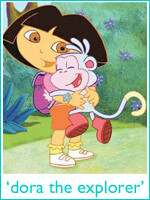 Will you use “Dora Saves the Mermaids” to teach your family about environmental responsibility? Do you think this is a valiant effort to teach ecology to preschoolers, or a good opportunity to market a new set of Dora-branded toys (or both!)? Is your family working together to go green? For more reviews and commentary on children’s television and other media, visit Children’s Media Consultant Online. Image courtesy of Children’s Media Consultant Online.